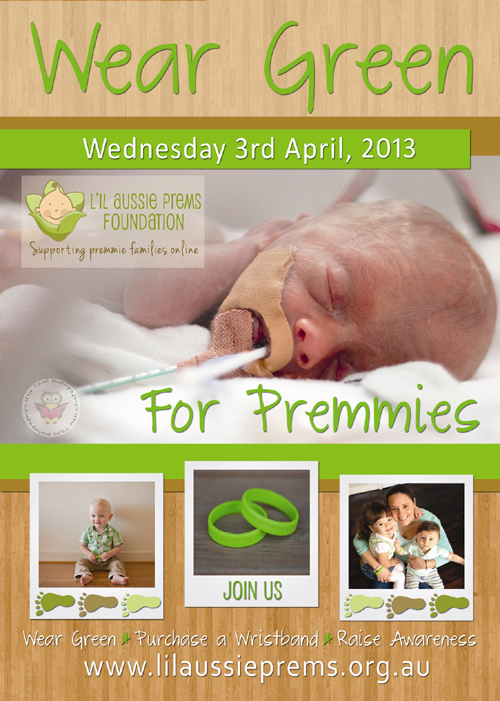 This week is the annual Wear Green for Premmies Day on Wednesday 3rd April, hosted by L'il Aussie Prems Foundation. The fundraiser aims to raise awareness of the trials and hardships faced by premature babies, by creating a 'sea of green' on social media throughout Australia and the around the world. L'il Aussie Prems Foundation President and Founder, Julia Toivonen says the event is a truly momentous day each year. Last year thousands of people, businesses and major hospitals all joined in the event, including Look@MyBaby. This year we will be joining in again. There are many ways you can participate too on Wednesday 3rd of April. There are events throughout the country and you can join the online event at Wear Green for Premmies Event Page. Simply post a picture of you going green for premmies. Wrist bands and other merchandise can be purchased from L'il Aussie Prems Shop. A donation can also be made directly to L'il Aussie Prems at L'il Aussie Prems Donations. This year proceeds from the event go to purchase items to donate to 2 Special Care Nurseries and 2 Neonatal Intensive Care Units (NICU) to support families affected by premature birth. 2013 is the third year of Wear Green for Premmies Day and each year has been bigger than the last. Look@MyBaby are proud to take part in such a worthwhile cause. We'll be posting our going green picture on Wear Green for Premmies Event Page and look forward to being a part of a 'sea of green'.